I'm looking for activities that can integrate computer science into lessons about DNA, RNA, and proteins in a middle school (ages 12 to 14) science class. Our school is using the NGSS and CSTA standards. The students understand a few basic concepts about these topics, but they're generally beginners. The scientific method - multiple papers have been written (I'll try to find a couple of the better ones) continually advancing the field; one of the later ones, about an encoding system called DNA Fountain approaches I think 86% of the theoretical limit for how much information can be stored in a nucleotide. The structure of DNA - what a deoxyribonucleotide is (phosphate group, base, etc) and how it is copied and created in the cell. Here also, you can make a foray into the sequencing and synthesis of DNA - a group called Oxford Nanotech is starting to make smaller, handheld synthesizers using nanopores (links will be added) and then there's Illumina's more classic method of fluorescence sequencing. You can talk about why synthesis is so hard - in the cell, a "primer", or strand of already created DNA, is needed to use DNA polymerase, the enzyme that helps "zip" together the nucleotides. Information theory, storage, and density. Talk about how Shannon realized that the amount of information in a message depends on how surprising it is - you know more when I say that "the sky is green" versus "the sun rises in the east". You can also talk about how efficiency is measured - how many units of information per unit volume (in DNA storage's case, bits per nucleotide). So, in English, efficiency (actually called information density) would have the unit volume be each letter. Let them explore, and try to create a more efficient alphabet - I'm guessing they'll gravitate towards something like Chinese, where whole concepts, phrases, words, and so on are represented by characters - i.e., a large character set, but each character holds a whole lot of data. Error correction, and how scientists are doing that in DNA. Homopolymers (i.e., 'aa', 'gg', etc) are a problem to be avoided in encoding systems. You could explain error correction in normal data, like checksums, and so on. Addressing, and how that's used in random access. Why random access is important in DNA storage. I could keep going (I'm just a bit excited about this field), but it would be well worth the doing to explain the various encoding systems used in research, and let them explore - who knows, they might come up with a great system of their own! I will add links as I have more time. This activity establishes a background experience that can later be used when teaching that DNA and computer data are sequences of discrete values. Each student picks three colors and creates a 27-character table showing all permutations of "codons" of the colors, akin to the 4^3 DNA codons representing amino acids. This activity was implemented in a U.S. grade 7 science classroom. 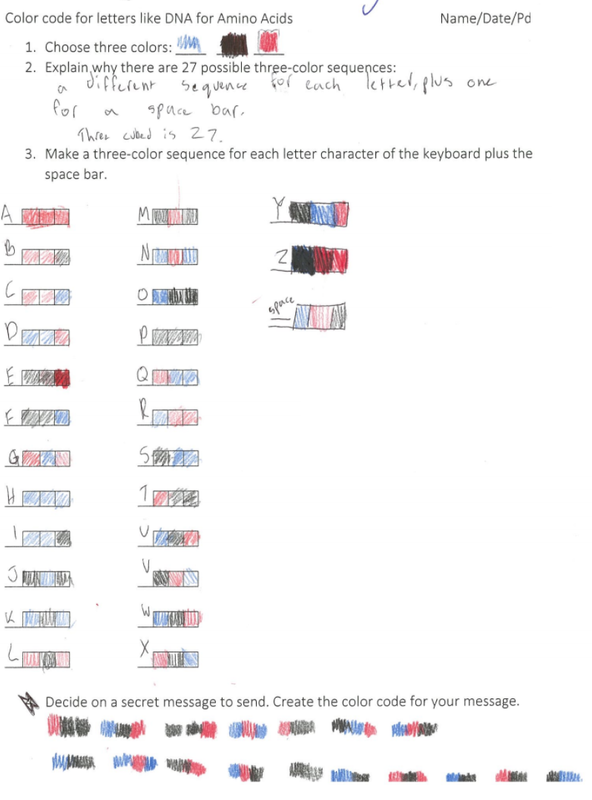 An example of the student work is shown below, although the printed worksheet was revised after the pilot to make more explicit connections to both computer science and genetics. Code.org, partnered with Project GUTS, has a CS in Middle School Science curriculum which includes a Life Science Module. This uses StarLogo Nova for modeling and includes unplugged activities as well. Use NCBI to obtain a 200-500 base pair sequence of mRNA for that protein in homo sapiens. Use NCBI to BLAST that sequence against NCBI database. BLAST is an alignment algorithm. While the supercomputer runs, discuss alignment as a computer science problem. GitHub uses an alignment algorithm to create the "diff"; MS Office programs use alignment algorithms to compare two files, displaying the results similar to "show track changes"
Select the best match from each of the top ten or twenty species. Download the set of matching mRNA sequences in FASTA format. Upload the data in the desktop program Molecular Evolution Genetics Analysis (MEGA) and use MEGA to create a phylogenetic tree, showing the most likely evolutionary relationships among the species based on the bit of data about that single protein. This activity has been used in one of the endorsed CS Principles curricula and is often implemented by AP bio teachers. Nuances in how to teach phylogenetic trees and the impact of these choices on student understanding of the biology concepts is reported in Smith 2013. Not the answer you're looking for? Browse other questions tagged curriculum-design cross-discipline biology or ask your own question.